Micro-influencers are a hot topic and has become just that over the last one or two years. And with all right. When talking about influencer marketing, a lot of people are picturing celebrities like the Kardashians holding up a protein shake with a smile on their face, charging up to $100,000 for a single post. But there is so much more behind influencer marketing than celebrities. Because in reality, those kind of marketing ways as mentioned above are way out of reach for most brands. A micro-influencer is an individual with a following of 10,000 and 100,000 followers on any given platform. Micro-influencers are often experts in a particular niche and know their audience very well. The best part is that because micro-influencers don’t have an extremely large following, they are able to establish genuine connections and relationships with their audience. This means that the micro-influencer establishes trust and authority in their niche, which is great when marketing brands to their followers. The big difference between micro-influencers and influencers (apart from the huge difference in follower count) is the price. While major influencers charge anything from a couple hundred dollars up to $100,00 for a single mention, other might take considerably more. Just recently we saw Kendall Jenner being paid $250,000 for a single mention on Instagram. I think we can conclude that large influencers generally charge a lot of a single mention on social media. So what about micro-influencers? 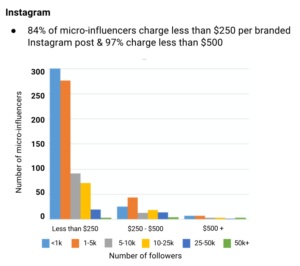 Micro-influencers are generally a lot cheaper than regular influencers, but it is hard to say a general price as there are so many factors that play a part, for example, followers, niche, and engagement. 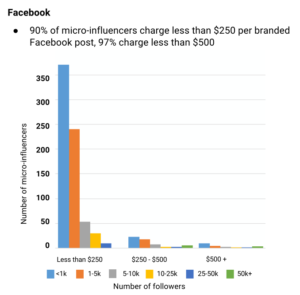 However, micro-influencers can charge anything from $20 to a couple hundred dollars, while some might only satisfy with a product sample from you. In this article, you’ll learn Why Micro-Influencers Are the Best for Your Brand. The individuals are often experts in a particular niche, and therefore attracts like-minded people. Often in a similar geographical area. 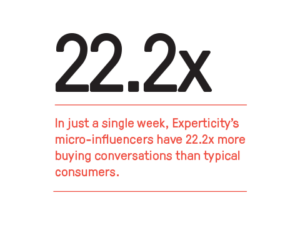 For brands who want to be extremely targeted with their campaigns, finding influencers located right outside their door can be extremely valuable. Compared to larger influencers, micro-influencers normally have a much higher engagement. Because these individuals often succeed in building a community of people with the same interest, having the micro-influencers social media as a hub, micro-influencers often have much higher engagement than “normal” influencers. In fact, in many cases, micro-influencers have shown that they can generate greater results than the larger ones, and at a lower price. Sounds like a great deal to me! A study shows that those with under 1000 followers boast an 8% like ratio while for influencers with 1-10 million the ratio drops down to 1.7%. That’s a significant difference that can determine a lot of the success you find during your influencer marketing campaigns. The high engagement is great when brands want to market on their page, as the followers of the influencer will trust their words about the product their marketing. Thus, leading to a greater impact, and ultimately better results. As we concluded before, many brands might not be able to pay the fees the larger influencers charge. However, with micro-influencers, it’s a completely different ball game. And, they offer great value for money. Too many brands are simply looking at the follower count of the influencer, in the belief that more followers will give better results, however that is not the case. While influencer prices rise in the pace as the follower count grow, it is not the follower count that you should bother – even if it can you a slight indication of how many you’ll reach. Because the reality is that the engagement level doesn’t increase according to the follower growth – meaning that larger influencers often have a lower engagement. What you should focus on is reach, higher engagement rates, better quality content, and a more targeted follower base. Because micro-influencers don’t have a huge following (relatively speaking) yet still have very loyal and targeted followers, the word of micro-influencers are often trusted more. That, combined with the fact that they are affordable makes for a high ROI campaign. If you have a budget of let’s say $3,000, it might not give you a lot when trying to reach out to major influencers. In fact, it might not give you anything. And even if your money would get you one influencer, it would be like going all in on roulette, betting everything at once. If you are smart, you’re spreading the risk with your money and don’t spend it all at once. Doing so is a great strategy because if you would realize that the influencer is completely fake, you would have thrown your money in the trash. If you, however, partnered with micro-influencers who charged $100 each, per marketing posts, your $3,000 would get you 30 marketing posts. As the popularity of micro-influencers has increased, so have the number of studies. Micro-influencers have a lot of undiscovered potentials, and unfortunately, many brands are still in the mindset that the only type of influencer marketing worth doing is celebrity influencer marketing or partnerships with individuals who have a huge following. Thankfully though, (or unfortunately) more brands are taking advantage of the tremendous results micro-influencers can generate. But that also means that the prices may rise, because of the rapid increase in demand. When looking for influencers, I recommend you to measure their engagement rate and the impact they have on their followers. After that, compare it with micro-influencers and see if the price you have to pay for the larger influencer is worth paying.